Digital outputs are used for many purposes and because of this they are carried out in different manners. 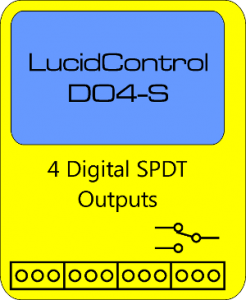 The LucidControl USB Digital Output Module has 4/8 outputs channels available in 3 options. For most applications solid state relays (SSR) are the best option since they are optically and potentially insulated and allow fast and continuous switching which is e.g. necessary when a pump has to be controlled in order to regulate the water flow through a hydraulic system. The power of pumps can be controlled this way. Often using a pulse width modulation i.e. a portion of time it is switched on then is is switched off. 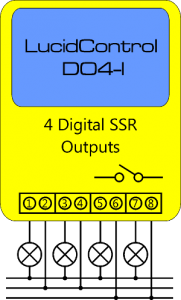 The figure beside shows the schematic of the DO4-I USB Digital Output Module with it 4 solid state relay outputs. The power consumers are represented by lamps. Solid state relays are preferable because they insulate the load to switch and the USB device including the host computer optically. This ensures a higher protection of the computer. 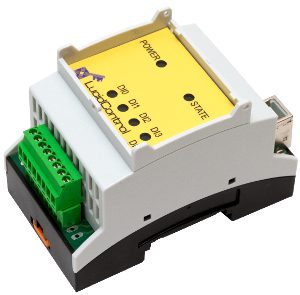 Moreover all outputs of the DO4-I/DO8-I USB Digital Output Module are completely independent and there are no common contacts and polarity of the signal does not play a role. The pictures beside show the principle of mechanical SPDT “single pole double throw” relays. 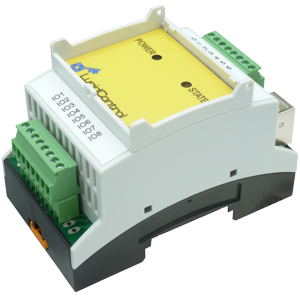 These relays allow switching of power consumers as well as of signals. Since the lifetime of mechanical relays is limited regarding switching cycles they are not suited for continuous switching. SPDT relays are insulated and potential free. 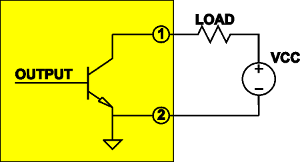 Any output can be seen as a complete independent unit. 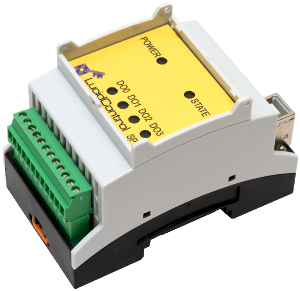 One of the advantages of SPDT relays is the fact that they are real mechanical switches and it is possible to switch measurement signals like RTD Pt100 / Pt1000 sensors without distortion. Moreover the picture shows that the DO4-S module has a 12 pin IO terminal. The reason for this is that each output provides 3 terminals. 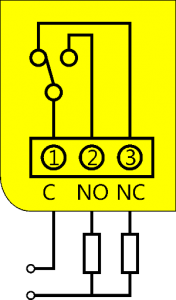 The common contact is toggled between the normally opened (NO) and the normally closed (NC) contact. This makes it possible to select one out of two signals. 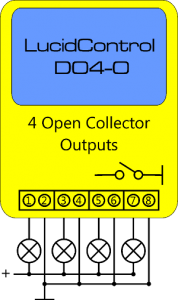 Open collector outputs use a transistor which connects a terminal to ground. 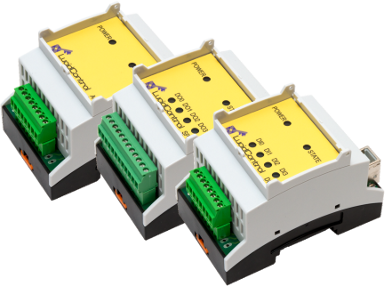 These switches have a single ground connection common for all 4 outputs of the DO4-O module and they do not provide an optical insulation like the two other options do. All outputs share a common ground. Beside of these drawbacks open collector outputs have one important advantage – they are very fast. This makes them a good option e.g. for dimming lamps and LEDs. For this purpose the DO4-I module is not fast enough, since the solid state relays are limited in timing which would result in detectable flickering of the light. By using the DO4-O module LEDs and lamps can be switched on and for only a few microseconds which avoids flickering.